Mehdin Taskin is dead. Murdered because the state can not handle a statue of a man who is a hero to many Kurds. He is the thirteenth Kurd killed by the state since the beginning of the ceasefire. Was it too early for such a statue? No, it was not, in my humble opinion. 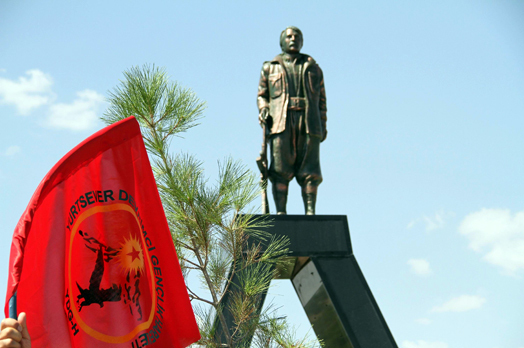 The Mahsum Korkmaz statue at the PKK graveyard in Lice district, erected 15 August 2014. The ceasefire is not just a state of non attacks between the army and the PKK and a period in which on high level a road to peace is being negotiated. The ceasefire also gives the Kurdish movement the chance to start building the democracy they envision in the towns and regions where they are in charge. This is one of the reasons why the ceasefire is so important to them. They are working towards the situation the peace process will eventually lead to: decentralization, and autonomy for the Kurdistan region (and for all yet to be defined regions in the country). In that autonomous Kurdistan, that the Kurds are entitled to according to international law, the Kurds will have all the freedom to live according to the nation they are. They have been building that nation almost from scratch since the first PKK attack, on 15 August 1984. They transformed from a people almost assimilated into oblivion to a proud nation, with practically everything other nations have too: their own media and politics, their own defence force and language, their own history. And, of course, their own national heroes. 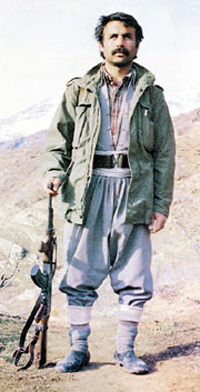 Mahsum Korkmaz, one of the PKK fighters who carried out those 1984 attacks, is one of them. No surprise at all that the Kurds want to honour him. Not the right time? Depends on how you look at it. The first attacks were exactly thirty years ago, so for the Kurds it’s a logical time. A provocation during the peace process? The state could have chosen not to feel provoked. Turkish media, Turkish politics, the Turkish army and historic narrative have never benefited the Kurds. Also the Turkish national hero is not working for them. Atatürk could have been their liberator too. 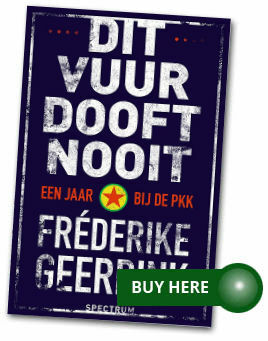 The Kurds thought that he was going to be exactly that when they decided to join him in his independence war. It is not commonly known, not even in Turkey, that the Kurds had independence within the Ottoman empire, didn’t pay taxes and their sons didn’t serve in the Ottoman army. For Atatürk’s forces, they changed their minds. Foreign powers needed to be kicked out of the country, the people of Anatolia wanted to rule their lands themselves. Mahsum Korkmaz, killed by the state in 1986. This picture is often seen at events of the Kurdish movement. Little did they know that Atatürk used them, and would let them down as soon as the country was founded. No way the Kurds would have anything to say in the new Turkey, or have any rights to rule or even be themselves. The Turkish liberation movement became an occupation force itself, in lands where Kurds had lived their own independent lives for centuries. Since thirty years, the Kurds fight back. They want the oppressive system out. The way Atatürk’s independence war was the birth of a nation, the first PKK attacks against the state on 15 August 1984 meant the birth of a nation too. 15 August 1984 is for the Kurds what 19 May 1919 is for the Turks. The Turks erected statues of Atatürk all over the country, the Kurds now erected their first Mahsum Korkmaz statue. It lasted less than four days. I understand a statue of Mahsum Korkmaz angers many Turks, since they see him as a terrorist. But many Kurds see Atatürk, of whom statues were put, on state’s order, on the central squares of their towns, as the man responsible for the death of tens of thousands of their people. Shouldn’t people of towns decide for themselves of whom they want a statue on their square? I sometimes wonder if Turks, who in general support the peace process, fully realize the fundamental change Turkey will have to go through before lasting peace is reached. That autonomy means just that: the locals decide. Not Ankara. So the Mahsum Korkmaz statue is a peek into the future of Turkey. A new Mahsum Korkmaz statue will one day be placed, maybe again on the graveyard in Lice, possibly on other places too. Another prediction: when peace has been reached and the PKK comes down from the mountains, the Atatürk statues on town squares in Sirnak, Hakkari, Siirt, Agri and Nüsaybin and many other towns will be replaced by statues of Öcalan. So Turks can get angry now about Mahsum Korkmaz in bronze, and the state can forbid it and pull the statue down and even take a young men’s life, but way smarter and humane would be to not get provoked but to just get used to it. Atatürk failed big time in being everybody’s hero. The Mahsum Korkmaz statue, and the future Öcalan statues, are only a logical consequence of it.